Smog is a serious problem in China. This year it actually shut down a few Chinese cities, halting de-facto everyday life. During last October, horrible smog shut down roads and airports around Beijing. By November the pollution levels had reached a record high in the capital city of northeastern China, Harbin. Some 11 million people were trapped in smog levels of 1000 micrograms particulate matter with a diameter of 2.5 micrometers. The safe levels according to the World Health Organization should not exceed 25 micrograms, while a level above 300 is considered hazardous. As a result, schools were suspended, traffic came to a halt and the airport was closed for incoming and outgoing flights. And it’s getting even worse. The huge pollution that can be seen from outer space is moving to neighboring country Japan, as if the relationship between those two countries is not strained enough. The Chinese, on the other hand, have been dealing with the smog in an original way: if you don’t like the results just change the way you measure! It fixed the pollution problem... by raising the danger threshold. If you don't like the frequency of your air-quality alerts, you don't have to keep them. That is the message that the Chinese government has made loud and clear as, Bloomberg reported last week. Shanghai's environmental authority took decisive action to address the pollution – it cynically adjusted the threshold for "alerts" to ensure there won't be so many. China has apparently decided that instead of accepting responsibility for the disaster, they will avoid it by making the "safe" pollution level over 50% more polluted (up from 75 to 115 micrograms per cubic meter) – almost 5 times the WHO's "safe" level of 25 micrograms. A team of Thai engineers and designers might have a solution for this growing problem. 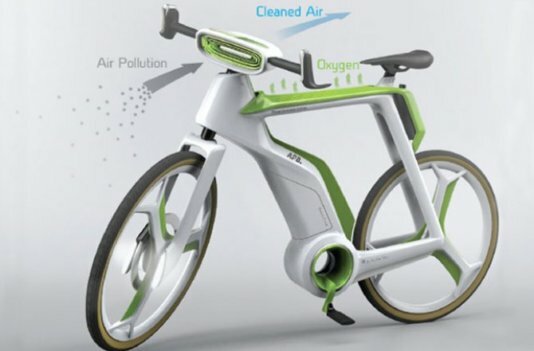 The team has developed a plan to turn the bicycle that millions of Chinese use every day, into a machine that actually cleans polluted air while cruising down the street. The air-purifier bike currently exists only in concept, developed by Bangkok’s Lightfog Creative & Design Company. In theory, its aluminum frame would run on a ‘photosynthesis system’ that generates oxygen through a reaction between water and electric power from a lithium-ion battery. The details on precisely how the air purifier bike would work – like how often the filter and battery would need to be changed, and how much air the tool could filter at which speeds – have yet to be determined. The designers only have mock-ups, which recently won a Red Dot design award. The designers also haven’t yet built a prototype, but plan to soon.